CHICAGO — Former 9th Ward Alderman and Cook County Board of Tax Appeals Commissioner Robert Shaw announced Thursday his candidacy for mayor of Chicago. The Kenwood resident, who moved back to Chicago in December from suburban South Holland, said he was the "strongest possible black candidate to challenge Mayor Rahm Emanuel." He said that he would remain in the race even if other blacks, such as Cook County Board President Toni Preckwinkle, decided to run. "I will be asking the people of Chicago to elect a new mayor," Shaw said at a news conference at the South Loop Hotel. "We intend to put together a coalition of people ... black, white and Hispanic, to make this candidacy work for the people of Chicago." One of the first things Shaw said he would be seeking to improve was the leadership of Chicago Public Schools; he's not happy with the schools chief. "I am dissatisfied with Barbara Byrd-Bennett closing all those schools. My plan is to look at how we can restructure TIF funds to see if it could be used to offset the school's budget deficit," explained Shaw. "And I definitely would be seeking an elected school board." Shaw said he was not worried about the millions of dollars Emanuel has in his campaign fund already. "Money is for name recognition and I already have an 89 percent name recognition," contends Shaw. "Harold Washington was outspent by his opponents when he ran for mayor [in 1983] and won, not once but twice." On the issue of crime, Shaw said the jury was still out on Chicago Police Supt. Garry McCarthy. "Maybe by the time I am elected he would have solved all the murders in Chicago," Shaw said. "But we'll have to wait and see how things stand a year from now." Emanuel responded Thursday that any talk of a mayoral race was premature. "There will be a campaign season," he said at a Gage Park news conference. "We're in the governing season. And the best way to get ready for the campaign season is to do your job during the governing season." Ald. Anthony Beale (9th), who now occupies Shaw's old seat in the City Council, acknowledged that Emanuel had to mend fences with various communities across the city. "There were some tough decisions that were made that ruffled a few feathers," he said. Yet that did not translate to his support for Shaw. "Everybody has a right to run," Beale said, quickly adding, "He doesn't have a chance." "I don't think he has the track record or the money," said Ald. Daniel Solis (25th). 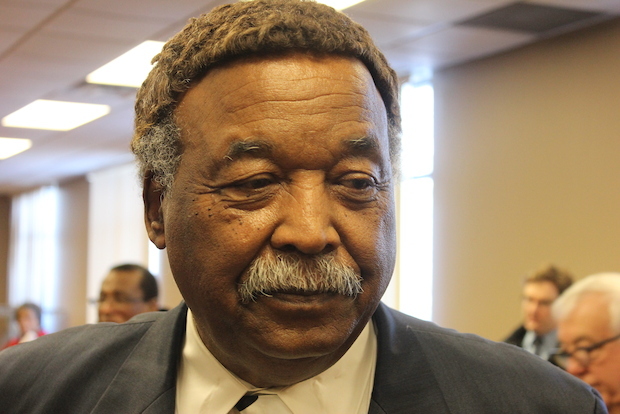 Shaw's late brother, William Shaw, was mayor of south suburban Dolton prior to his 2008 death. William Shaw had appointed his twin brother as the village's $70,000-a-year inspector general, which angered some village residents and officials. Former U.S. Rep. Jesse Jackson Jr. had accused the brothers of trying to confuse voters during the 2002 primary election by allegedly recruiting an elderly south suburban man named Jesse Jackson to run against him. Jackson even sued the Shaws in Cook County Circuit Court for allegedly circulating and collecting signatures on nominating petitions fraudulently, but the suit was dismissed in 2004. Emanuel brushed off questions Thursday about a possible Preckwinkle candidacy, saying, "Give me a break." Preckwinkle has repeatedly said she is running for re-election and intends to serve out her term as Cook County Board president. Asked whom she would back if Preckwinkle ran for mayor, Ald. Carrie Austin (34th) said, "I'd have to give that some thought."